The Army’s High Energy Laser Mobile Demonstrator (HEL MD) is the most recent military project to grace the White Sands Missile Range at Elgin Air Force Base. Designed to offer an uncompromising balance of precision, contraollability, predictabilty and repeatability for small tactical units at the brigade level, the HEL MD consists of a rugged high energy 10 kW laser weapon installed to a modern tactical military vehicle. Using the HEL MD in a battle scenario requires a two-man team, consisting of a vehicle and weapon operator. The vehicle operator is in charge of running the 500 hp Caterpillar C-15 engine, Allison 4500 SP/5-speed automatic transmission, 8×8-axle, 16-ton payload capacity vehicle. The weapon operator is in charge of the 10 kW tailored commercial laser, to be upgraded to a 100 kW-class laser in the next few years. …which he operates with an XBOX 360 controller. Some may scoff at the thought process behind this decision, but this isn’t the first time such ingenuity has been implemented for military innovations. 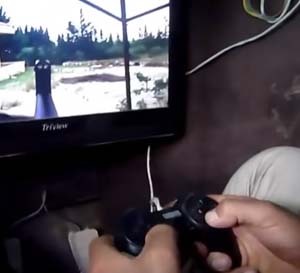 Smithsonian also reports  that in 2012, Syrian rebels fashioned a home-made tank out of spare and scrap parts, and used a PlayStation controller to operate its weapons system.